If you use Muscovado sugar – your toffee mixture needs to cook for longer since there is more liquid in Muscovado sugar than regular white sugar – pay attention and have patience while cooking your toffee. Better to cook the toffee longer and on lower heat, then blast away on too high heat, you risk burning the toffee mixture if you do. To make fruit toffee use white sugar to keep the color from the fruit you are using, also use the following measurements for the fruit; 200 grams of frozen fruit, reduce the syrup to 2 tbsp, and use 4 dl/400 ml of white organic sugar and 1,5 dl / 150 ml of oat cream. You can also use luscious dark chocolate instead of cocoa powder, the toffee will be slightly softer but so much more delicious! I use 100 grams/3.5 oz of dark chocolate, and I add this after I melted all the other ingredients to a liquid. Add toppings such as chopped nuts, sea salt, peppermint pieces and so on after pouring the toffee mixture to set. 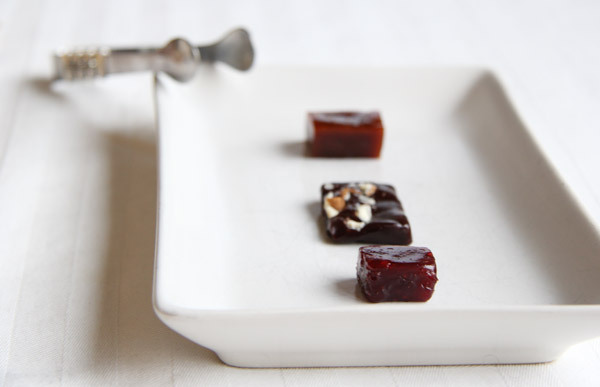 Create a batch of toffee, then dip your toffee pieces in melted chocolate and let set before wrapping. Very decadent indeed. Also – this is a great opportunity to add some decorations such as chopped nuts, grated coconut etc, to take your toffee to a whole new level of yumminess.